Awake, O Little Mocassins and dance for me tonight. My vast domain spans half of Canada, the world's second largest country, with ports facing three great oceans. I follow the trails of natives and voyageurs westward from Lake Winnipeg and the forks of three historic rivers to the misty *Haida Gwa'ii, where British Columbia meets the North Pacific. Near majestic Mount Robson, Canada's highest peak, my second branch meanders south via Kamloops to Hope, gateway to the Fraser Valley. Crossing me is a journey into history, with Indian encampments older than Egypt's great pyramids, pristine national and provincial parks, ancient shrines and battle sites. Ethnic dances and pageants salute every facet of Canada's heritage, and if you love the magic of serendipity, a new surprise awaits around each bend. If you find some parts of the country a little "behind the times " ... a popular Saskatchewan Tourism poster says, "Count yourself lucky. You've discovered the true Canada." Get a copy of my official Road Map, or a reasonable facsimile? Stretch it out on the table or across the hood or your vehicle. Glancing from east to west, you'll see that my eastern terminus is Winnipeg, Manitoba at the foot of two large lakes. Tracing my path westward, I parallel the North Saskatchewan River to Edmonton, and follow the Athabaska River into Jasper National Park, Canada's Rocky Mountain playground. Further west near Mount Robson, I give motorists the option of heading directly west via Prince George, or south via Kamloops to the town of Hope at the entrance to the Fraser Valley and port of Vancouver. On these segments I follow the North Thompson, the Mighty Fraser and Skeena Rivers. Canada's Historic Route. 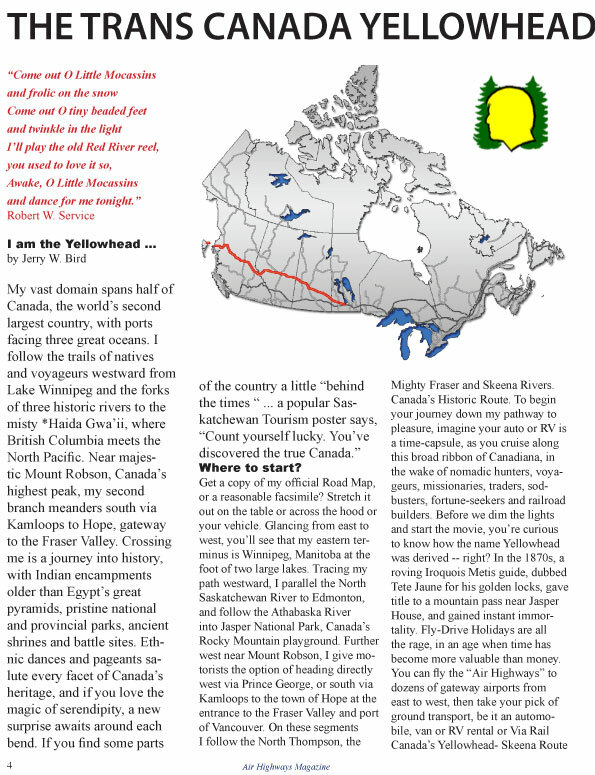 To begin your journey down my pathway to pleasure, imagine your auto or RV is a time-capsule, as you cruise along this broad ribbon of Canadiana, in the wake of nomadic hunters, voyageurs, missionaries, traders, sodbusters, fortune-seekers and railroad builders. Before we dim the lights and start the movie, you're curious to know how the name Yellowhead was derived -- right? In the 1870s, a roving Iroquois Metis guide, dubbed Tete Jaune for his golden locks, gave title to a mountain pass near Jasper House, and gained instant immortality. 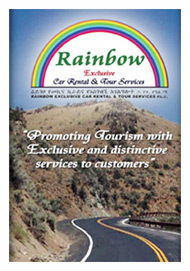 Fly-Drive Holidays are all the rage, in an age when time has become more valuable than money. 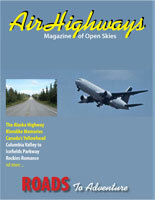 You can fly the "Air Highways" to dozens of gateway airports from east to west, then take your pick of ground transport, be it an automobile, van or RV rental or Via Rail Canada's Yellowhead- Skeena Route to Prince Rupert. A Taste of Canada. I appeal to nature lovers and adventurous souls with a taste for the finer things. So, get out the fishing rod, thermos jug and picnic basket! This great drive might easily be called a Great Canadian Taste Tour. Why? -- the Yellowhead crosses and parallels famous rivers and nameless streams, skirts many lakes great and small, visits orchards, ranches, farmers markets and unique dining spots. You can feast on Winnipeg Goldeye, rainbow trout, Pacific salmon, Alaska king crab, oysters, mussels and clams, prairie chicken, moose steak, buffalo burgers, award-winning Alberta beef and Okanagan wines. Add the world's finest cereal grains and 1001 varieties of ethnic fare -- how near to heaven can you get? And if you like to sing on long car trips, there's always a cinemascopic backdrop to enhance the performance; prairie skies, tumbleweed, moose pastures, rippling waterfalls and pristine mountain lakes. Can't you hear Rose Marie's "Indian Love Call" echoing in the distance? An Expanding Panorama. To those who cherish folklore and love to collect anecdotes of Canadian history, a trip along my ribbon of asphalt is a veritable feast. Each native or ethnic village, national park and historic site along my path tells its own story, of an event, place or special person who left his or her mark. All contributed to the fabric of Canada, Often it is the foreigners who see the treasure most clearly. Sir Arthur Conan Doyle, creator of Sherlock Holmes compared Canada to an expanding flower; "Wherever you look you see some fresh petal unfolding." Sir Winston Churchill spoke of Canadians, "There are no limits to the majestic future which lies before the mighty expanse of Canada, with its virile, aspiring, cultured and generous-hearted people." My territory embracing the best of four great provinces is a Bonanza for photo lovers, be they shutterbugs or professionals. On discovering so many amazing photo ops - birds and wildlife, cultural treasures, glories of nature - big city activities - small town events -one could easily add a day or two to their travel agenda. Lucky you!. "The way of yesterday's fur traders has become the way of today's smart travellers; no other route offers so many national and provincial parks ." 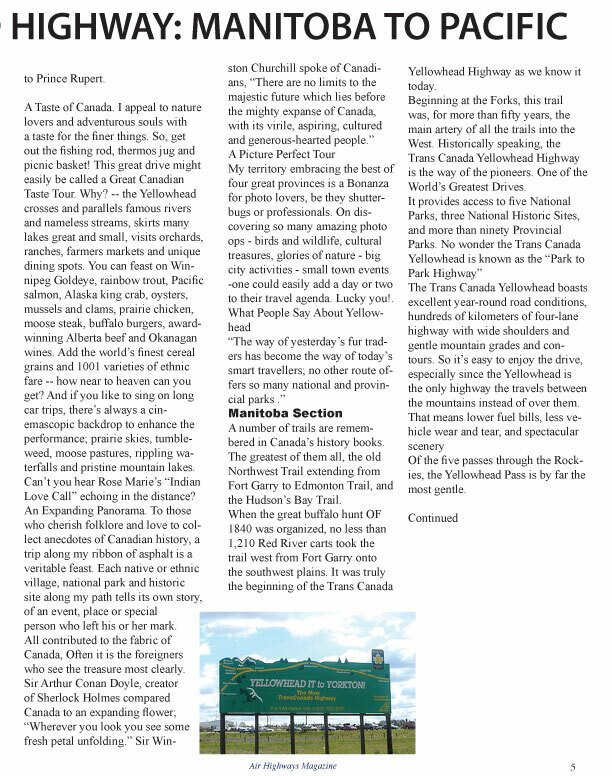 A number of trails are remembered in Canada's history books. The greatest of them all, the old Northwest Trail extending from Fort Garry to Edmonton Trail, and the Hudson's Bay Trail. When the great buffalo hunt OF 1840 was organized, no less than 1,210 Red River carts took the trail west from Fort Garry onto the southwest plains. It was truly the beginning of the Trans Canada Yellowhead Highway as we know it today. Beginning at the Forks, this trail was, for more than fifty years, the main artery of all the trails into the West. Historically speaking, the Trans Canada Yellowhead Highway is the way of the pioneers. One of the World's Greatest Drives. It provides access to five National Parks, three National Historic Sites, and more than ninety Provincial Parks. No wonder the Trans Canada Yellowhead is known as the "Park to Park Highway"
Of the five passes through the Rockies, the Yellowhead Pass is by far the most gentle.